5 years. FIVE YEARS. No matter how I write it it still looks insane! 5 years ago I was super involved with a Goodreads group that I created in 2008 and I decided that I wanted to start a blog but didn't think I read enough to support a whole blog on my own. So I put the idea out there and some of my FAVORITE members from the group responded and we started putting it together and debuted the blog 5 years ago (yesterday really). I loved it SO much that I started my own blog the very next day. 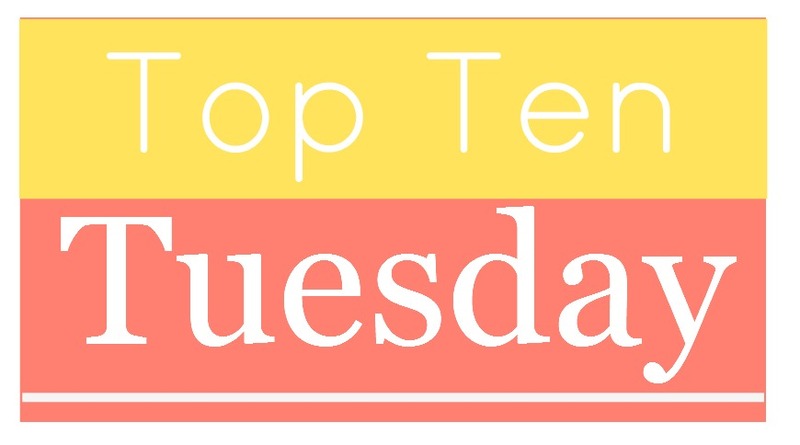 I haven't been AS active on this blog as my own these past 5 years but Top Ten Tuesday has still remained my baby all these years. When I came up with the idea I didn't think anybody would want to play but OH MY GOD YOU ALL ARE AMAZING. Thanks to ANYBODY who used to do TTT, still does or even reads the posts but doesn't participate. Thank YOU for the support and for making Top Ten Tuesday the weekly fun that it is. TRULY I MEAN THAT. I know the topics aren't always easy or perfect but I'm giving my brain some kudos for coming up with topics for these past 5 years (yes we debuted Top Ten Tuesday our first week!). 1. Top Ten Seasonal TBRs -- I know this is cheating but I really love the seasonal TBRs 4 times a year. Even though I'm a mood reader, I like making a plan and I LOVE finding new books from people's TBRs. 2. Top Ten Inspiring Quotes From Books (Well, really ANY quote posts) -- I LOVE QUOTES. Also I have found anytime we do a quotes post I find new books to add because I love getting a little snippet of a book! 3. Top Ten Places Books Have Made You Want To Visit -- I looove good settings and it was so fun to think of all the places I've "traveled" via books and I LOVED reading YOUR posts because I definitely added some books based on their setting. I really loved the post for this I did on my own blog. 4. Bookish Pet Peeves -- RANTING IS FUN. 5. Underrated Books/Authors lists -- I LOVE when we get a chance to spotlight all those underrated authors and books. It's so nice to see so many books I may have not heard of. 6. All of the end of year & beginning of year topics (best books, new favorite authors, bookish resolutions, most anticipateds) -- cheating like a boss on this one but I seriously LOVE the end of the year and beginning of the year topics. Makes wrapping up and starting the new year easy. 8. Top Ten Things On My Reading Wishlist -- this was sooo fun to talk about all the kinds of books I'm just DYING to find 1) because my imagination ran wild 2) you guys gave suggestions for things I was pining for and 3) YOU GUYS ARE SO CREATIVE. PLEASE WRITE ALL THOSE BOOKS. 9. Ten things on my bookish bucket list: this one was so fun to think of things I wanted to do related to books and general book nerdery! You guys made me realize there are some things I didn't even know NEEDED to be on my bucket list. 10. Top Ten Characters You Wish Would Get Their Own Books: This happens a lot to me when I read...I read a character who isn't the main character but I wonder SO much about their story and want a whole book about them. Had SO much fun with this topic! - Back in 2012 I did top ten things books have made me want to do after reading them! - Top Ten Characters Who X: we got to pick anything and I picked characters who loved words! What have been some of your favorites?? Congrats on this historical anniversary, ladies!!!! It's such a huge accomplisment!! I always wondered how you guys started doing this together! <3 The Seasonal TBRs are always my favorites, too. Totally not cheating!!! And End/New Year Topics, yes!! I wish I'd done more of the fun topics. It felt like cheating to choose a bunch when I hadn't done them! I hope you do some again...especially the cover topics! I've been with you for almost all five years I think I started TTT about a few months into its inception. I had a lot of fun looking back on my blog to pick out my favorites! Thanks. Congrats on this 5 years, itá amazing! I'd love to do the top ten characters who should get their own book tag. There are so many awesome secondary characters who I wish were main characters in their own story. Maybe I will next time you guys do a top ten rewind. A big happy birthday, Top Ten Tuesday! Happy blog birthday! :) I love the seasonal TBR lists too. Along the way, I've actually started using them (novel concept, I know!) to answer the overwhelming question of what to read next and I'm so proud of myself when I start crossing books off the list. And, since I'm always on the lookout for new amazing reads, the TBR list posts are my favorite ones to look at on other people's blogs too! However, I actually listed my #1 favorite topic as Covers I'd Frame As Works of Art! This is such a fun thing to do. I don't participate all the time, but I do check each week to see what topic and how it has been tweaked. Love it and congrats on 5 years! Congratulations on 5 years :) I've only been blogging for a year but TTT was a meme I've been following longer than that! I love the lists and it's introduced me to so many new books over the years. Here's to at least 5 more! Congratulations on five years. Thanks to everyone who comes up with the great conversation topics each week! Congratulations on 5 years! Thank you so much for doing TTT, and having something fun for everyone to participate in! Congratulations on 5 years. 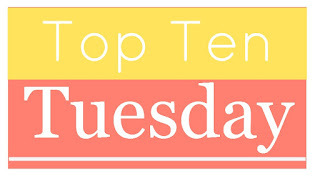 There have been some really awesome Top Ten Tuesdays. I loved the bookish problems one from earlier this year. Great idea for today. I loved to go through allt he old posts. Congratulations on five years of a great topic. Great list! Congratulations on 5 years! Happy birthday TTT!! :D I love the one about books that make me want to visit places, there's so many fantasy worlds I'd love to visit! Happy Birthday Top Ten Tuesday! This is actually the first TTT post i've ever taken part in, although I have really enjoyed "meeting" blogs through this feature and being introduced to many new authors and titles. *raises a glass* here's to another five years.